Do you love busy bags? My favorite busy bags are ones that are easy to set up – and this one was quick, quick, quick! Cut the craft foam into various shapes – we kept it simple with circles, rectangles, triangles, and squares. Then punch a hole in the center of each shape. And give the to your child to lace onto the shoelace. I like using shoelaces better than ribbon or yarn because the tips are reinforced and don’t start peeling. If you don’t have extra shoelaces, you can put some tape on the ends of ribbon to strengthen it. It’s frustrating for little fingers when they can’t lace because of a ribbon falling apart! Looking for more busy bag ideas? 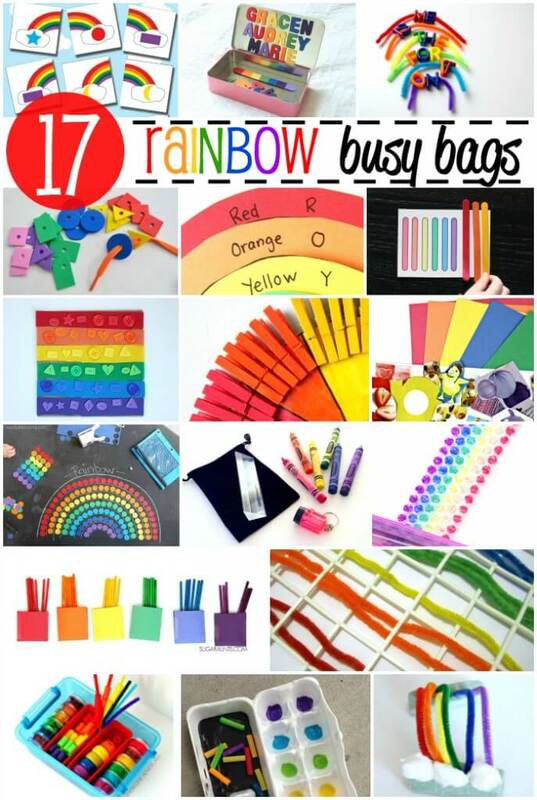 Here are 15 other fun RAINBOW ideas to try!